A Buck by any other name might be Hogan, Logan or Williams. I think we have a case of surname schizophrenia. We have four surnames involving 3 people. Do you sometimes wonder why you or one of your relatives matches a whole group of people by a different surname, and none by the surname you expected them to match? This 1888 Indian Census page for the Seneca on the Allegany Reservation in New York just might give you a clue as to why you’re not matching whom you think you should be matching..
Not matching who you expect to match is sometimes called a Nonpaternal Event (NPE) or I prefer the term undocumented adoption. But this case doesn’t seem to be undocumented at all…it’s well documented….it’s just that we can’t understand it. So let’s say this is your family and the husband, I presume is Augustus Buck. So far, that looks normal. But this is where normal ends. Your name is Acsah. If you’re married to Augustus Buck, your name would be Acsah Buck. This is how all of the other families are recorded, so you would be too. Except you have this little note that says either (Logan was) or Hogan was). Is that a maiden name? No one else’s maiden or other names are listed. Is Acsah maybe not the wife of Augustus and the mother of Alfred noted below? If that is the case, then why are they listed as Buck now? And Alfred has his own set of problems. He is noted as Alfred Buck, age 2. 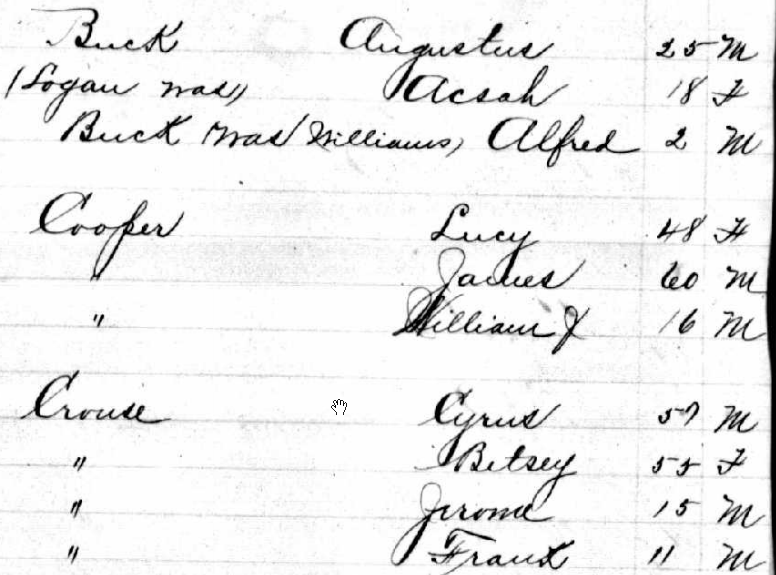 One would assume the child of Acsah and Augustus Buck, judging from the rest of the entries. But Alfred had this note that says (was Williams.) What does that mean? It’s certainly not his maiden name. Does that mean that Alfred isn’t a Buck at all? Is Alfred even the son of Acsah? Is Alfred really a Williams. Was Acsah married to a Williams before Augustus? That would seem to be pushing it given that she is only 18 and Alfred was born when she was 16. Did she have time to be married earlier? So, if Alfred’s descendants were to DNA test, would they match a Buck, a Williams, a Hogan or a Logan? Or maybe none of the above if Acsah had Alfred before she married Augustus by someone not listed on the “was” list. Maternal naming was a very common Native American occurrence and what is today considered to be illegitimacy was not viewed through the lens of colonial or Victorian America. And just think, if you are Alfred’s great-grandson and you took the Yline DNA paternal line test, expecting to match a Buck, and you were instead matching a Williams, Hogan or Logan, and if you never saw this census page, you would have no clue as to potentially why. Of course, if you aren’t matching a Buck or a Logan, Hogan or Williams, then all bets are off. But at least, there is a clue here that something is not like the rest of the families recorded in the census. It’s something to work with. This entry was posted in DNA, Seneca. Bookmark the permalink. My grandmother’s name was Achsah Williams. I was surprised to see even her first name, not the combination. I knew I had seen that name before. Now I know why it looked so familiar:) It’s very unusual.